1. First and foremost, anytime you light a candle, make sure it’s on a safe surface. I like to use metal trays or metal candle holders. Ninja tip: When you light a candle, set an alarm to remind you to blow it out. The only fire we want burning is the wick from your fave candle or the flame in your heart for your boo. 2. Trim the wick by a ¼ inch. This helps reduce black smoke, controls the crazy flame and helps with an even burn. 3. The first time you light a candle, let it burn to the edge of the vessel to prevent tunneling (wax has memory and will continue to tunnel, wasting precious wax and burn time). Don’t fret if your candle has already started tunneling. 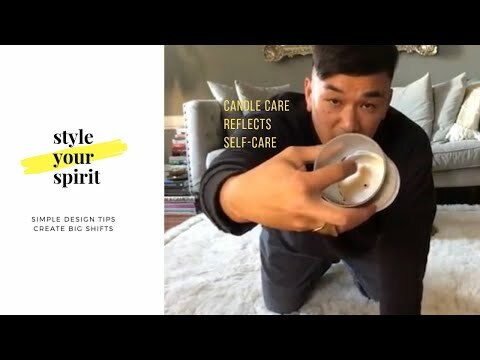 Here’s a cheap, simple hack to fix the tunneling, plus find out how candle care can help you reflect on self-care. All this talk about people not being aware of something as simple as candle care made me think – what in my life am I not aware of? Am I burning my candle at both ends by working too much or booking too many social events? 1. Take stock of the things that stress you out. Write them down. Ask for help and/or eliminate the things that bring you stress, if possible. 2. Don’t double book. Keep a calendar. I use Google Calendar to keep my schedule on point for my personal, professional and social events. 3. As you take care of your candle, take care of yourself, also, by doing one thing a day for you. You deserve it, boo. If you don’t take care of yourself, you won’t be the best version of you for your beloveds. If you burn two different kinds of candles at once, you could marry two luscious smells together and reach apothecary nirvana. lol. Just play around to see what resonates with you. It's like pairing a nice wine and cheese. I like to light earthy, woody, sultry candles during the winter and lighter, fruity candles in the spring. There is no right time to light a candle — it's whenever your soul desires. The only wrong time to light a candle is when you're about to go to sleep. Don't do it! To trim the wick, I used a Diptyque Wick Trimmer. Some of my fave candles: Apotheke, Astier de Villatte, CireTrudon, Tatine, Village Common. Also, John Derian just released a new delicious candle called, most appropriately, The Scent. It has all of my fave smells, including a bodacious blend of natural wildflowers, lavender, violet, jasmine, heliotrope, neroli and currant blossoms set on top of a classic resin base of Agar Wood, laburnum, sandalwood, patchouli, musk and frankincense. If you learned something new or if you want help with a design issue, hit me up in the comments below. Sharing is caring, so hit that follow button and share this with your peeps.